This special edition includes the epic origin story, Failed Crusade, that inspired five volumes of demon hunting across the multiverse (and multiple genres.) This fantasy story has an amazing twist ending. The original Codex stories appeared in The Crimson Pact anthologies as The Transition and The Merging. These stories are connected to each other, and to Failed Crusade at their roots, but occur many years later. They follow an unsuspecting foreign exchange student named Sloan Boyle. A seemingly innocent interaction with a stranger in a Spanish Cafe leads to a dangerous series of events, and a weighty discovery that threatens everything Sloan ever knew about this world and his role in it. Club PK2 is written in the same Codex universe as the other stories but is a separate adventure with distinct characters. The voice is reminiscent of Supernatural. It follows a hardened cop named Tray sent undercover on special assignment to expose a dangerous underground fight club. The cop discovers much more than a bunch of thugs trying to make a buck, and he learns something about The Codex, and the demon's master plan in the process. The Codex ended up playing a pivotal role in the final story, Sealed with Fire. This epic final battle between The Crimson Pact and the demons pays tribute to the best stories and characters in the series. As you finish listening to this omnibus edition, I hope you'll be interested in learning how The Codex impacted the final fight. If that's the case, you'll want to pick up The Crimson Pact, volume five. If you could sum up The Codex in three words, what would they be? This story takes an average young man and thrusts him into an adventure of a life time, or should I say several life times? We all harbor a fear of the unknown, and when Sloan is approached by a Stranger who seemed to have purposely picked him out of a crowd, that fear rears it's ugly head in Sloane and he must learn the purpose for the encounter and what he is suppose to do with the knowledge he is gaining from an unknown source. What does Steve Barnes bring to the story that you wouldn’t experience if you just read the book? Steve Barnes give the story a touch of realism, as you can hear the doubt, surprise and resolve in his voice as he progresses through the stories. Hearing the words spoken instead of reading them, make very clear the intent of the author at any particular point in the book. There is a moment when Sloane realizes that he has been with this same group of souls before, although he doesn't recognize the faces or names. I think it was his Ah Ha moment and the woman he had loved through all those other lives was still there and waiting for him to open his mind and rejoin them. 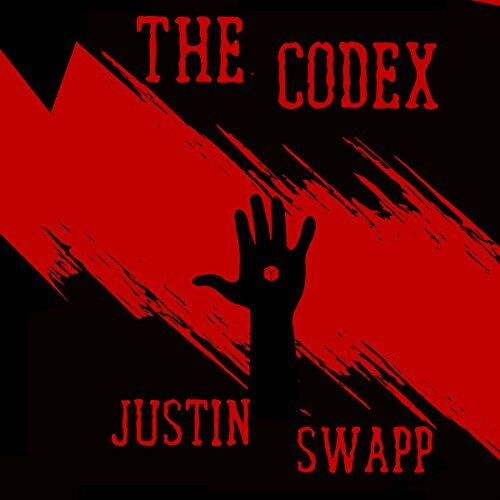 I would recommend The Codex to anyone who follows Justin Swapp and his amazing ability to spin a good tale. His brand of story telling brings the reader right into the middle of the action and makes you duck when fists start flying and chairs are crashing into walls. A first rate writer, who I hope has many more stories to tell. It's a fantasy book that was actually several related short stories in one. The stories went along at a good pace and drew me in. Overall, a good book and will be enjoyed by fantasy fans. Three great stories based on an influential novela, which is included as the first story. Dark, good stuff. Well-written and well-narrarated. I listened to it twice in a row. If you like stuff like Dan Simmons' Hyperion Cantos, you'll really enjoy Swapp's work. This was an enjoyable fantasy book that was actually several related short stories in one. I listened to the Audible version of this story, but I had kind of a hard time with the narrator. It sounded as if he was whispering most of the story (and no, I did not have the volume turned down). Other than that, it was fine. The stories went along at a good pace and drew me in. Overall, a good book and worth the read for fantasy fans. The narration and writing on this were well-done, but it wasn't really a story for me. However, if you enjoy haunting narration of madness and the occult and demon hunting, then this might be for you! this is a thrilling tale that really shows off Justin's influences such as J.R.R Tolkin or even George RR Martin. he's a great guy and a brilliant story teller. check out his work. What a fantastic story. the battle scenes were riveting and characters were well thought-out and created. Swapp and the other writers in this book have a skill for weaving together an exciting story that leaves you wanting more. The idea behind the codex cube is inventive and fun. The reader put together a beautiful performance. His accents were excellent, and he had a style that brought the story to life. I thoroughly enjoyed this adventure and look forward to reading more from Swapp. This is very different from the books I usually listen to, which is probably why I liked it so much. Each story is related to the next, but is also it's own story. I would describe it as dark fantasy. Very interesting and great narration! I enjoyed the stories in this book.I found Steve Barnes to be a good narrator. I especially liked the Codex itself.I was given this book free for an honest review. I was enthralled by the storyline. The way the author portrayed the characters and background had me hooked from the beginning. I only wish there was more, I didn't want the story to end. I enjoyed most of the stories in this compilation.A great concept with interesting characters.Steve Barnes was a fine narrator.I was given this book by the narrator,author or publisher free for an honest review. I'd never heard of this series or universe but was intrigued by the blurb, the first story is dark and fleshes out some of the backstory. The tone was good and it was an interesting listen, probably more so if you know of the books its based around but still intriguing without any foreknowledge. The next stories are more urban fantasy set in our world and are linked together, again the tales can be dark at times but its a more familiar world so is easier to get on with. The narration was good, Steve Barnes did the voices well and portrayed the emotions of the characters in the right way, he can sound a bit whispery at times but I've heard a previous book read by him (The Magic Shop) so was used to his voice. I might lookup the main series that spawned this now as it sounds an interesting premise, you'll probably rate this higher if you know the series already but its still good.